This is a post I composed more than a month ago. I intended to go back through the book and be accurate about the dates when various treatments were introduced, but I don't have the energy to do that now. Please excuse any errors of that type. As I mentioned in the beginning, learning about cancer has been a hobby of mine for the past several years. And we all know that recently I've started Living The Dream by becoming even more engrossed in the complete cancer experience. Well, not truly complete. My cancer doesn't come with surgery (yet) so I am being denied the experience of removal of some useful part of my body. If my experience is inspiring you to consider cancer as a hobby, I can recommend two great foundational documents. The first is a book published in 2010 titled "The Emperor of All Maladies: A Biography of Cancer", by Siddhartha Mukherjee. My second favorite cancer document is an academic paper that I'll describe in a future post. Siddhartha Mukherjee (born 1970) is an Indian-born American physician, scientist and author. He wrote the 2010 book, The Emperor of All Maladies: A Biography of Cancer, which won the Pulitzer Prize for General Nonfiction and the Guardian Prize, was nominated for the National Book Critics Circle Award and was described by Time magazine as one of the 100 most influential books of the last 100 years, and by The New York Times Magazine as among the 100 best works of non-fiction. Currently he is an assistant professor of medicine at Columbia University and staff physician at Columbia University Medical Center in New York City. He has been the Plummer Visiting Professor at the Mayo Clinic in Rochester, the Joseph Garland lecturer at the Massachusetts Medical Society and an honorary visiting professor at Johns Hopkins School of Medicine. A hematologist and oncologist, Mukherjee is also known for his work on the formation of blood and the interactions between the micro-environment (or "niche") and cancer cells. Given the prizes the book won you can guess that the book is good. Obviously I agree. The best aspect of the book is captured in the subtitle, "A Biography of Cancer." 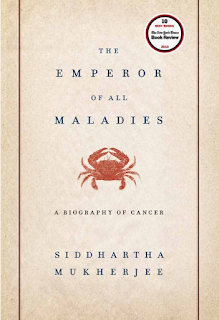 Mukherjee traces the history of cancer from ancient times to the present. The entire book is a fantastic treatment and very readable. I'll describe some of my favorite aspects. The first impression I formed was how young the concept of "cancer treatment" is. Even though cancer was described as a disease as far back as the ancient Egyptians and Greeks, up until the early 20th century there were no treatments for virtually any type of cancer. If you were diagnosed with cancer before that time, doctors would not even want to see you any more - you were doomed and they had no tools whatsoever to help you. The first treatment was surgery, which emerged in the late 19th century. If a tumor was localized, surgery might successfully treat it. Surgeons learned over time that if they left any cancer in the patient, it would recur. Thus the emergence of procedures like the radical mastectomy. Mukherjee points out that "radical" in this context doesn't mean "extreme", it means "root" - the radical mastectomy evolved because surgeons were trying to get all of the cancer, including its "root". Given that, surgeons did indeed take it to extremes. Mukherjee's descriptions of radical mastectomies at their most extreme in the 1920s are horrifying. That legacy of surgeons leading the way on cancer treatment would have serious implications decades later. In the 1950's through the 1970's as chemotherapy began to emerge it was very difficult to prove its effectiveness because women traditionally saw a surgeon first and surgeons were disinclined to refer patients to trials that evaluated non-surgical treatments. In fact, surgeons were outright hostile toward non-surgical treatments. Of course, surgery was of no use for non-localized cancers like leukemia. So researcher kept searching for other ways to attack cancer. Radiation therapy emerged around the turn of the 20th century but was relatively crude. It could also only be used to target localized cancers, and the use of radiation is a delicate balance - in cancer treatment one wants to deliver enough to kill the cancer cells but not so much that a new cancer is spawned years or decades later. Chemotherapy didn't emerge until the 1950's, having been discovered and pioneered by Sydney Farber at Children's Hospital in Boston in the late 1940's. Its use grew through the 1950's and became mainstream, especially for leukemia and other blood cancers, in the 1960's. It wasn't until the 1970s that what I think of as modern cancer treatment, informed combinations of surgery, chemotherapy and radiation, became the norm. Muckerjee also covers the political emergence of cancer and the emergence of large advocacy organizations like the American Cancer Society, mostly the work of Mary Lasker. And he describes the early days of cancer research at the National Institutes of Health and then the National Cancer Institute. The book concludes with a sort of philosophical discussion of the unique nature of cancer that makes it hard to defeat. After all, cancer is us. it is our own cells gone haywire. That can make it very hard to attack because one must devise treatments that can discern "normal self" from "cancerous self". That turns out to be a very difficult biological task. Especially given that cancer cells have devised ways to, among other things, evade recognition. I can't recommend the book more highly. Sounds very interesting. This book kept coming up as a suggestion on my Kindle Fire while reading "The Immortal Life of Henrietta Lacks" (which I literally just finished today, before visiting your blog -- and which you might also be interested in reading!) I'll be reading this one soon! p.s. We're all thinking of you!